How do you go about getting your toddler or small child to eat more healthily? Here are some simple do’s and don’ts to adhere to! • Do breastfeed if you can! Of all the strategies for preventing childhood obesity, the only one with scientific evidence is breastfeeding. The chances of becoming overweight are 20-30% lower in children who were breastfed. • Don’t introduce solids until age 6 months. Don’t rush to start solids. There is no evidence that it helps a baby sleep through the night and may cause unnecessary stress on their immature digestive systems. • Do let your child see you enjoying healthy foods. Children are mimics and like to eat what others are eating. So try to let them see you eating healthy foods and making healthy choices as often as you can. • Don’t worry if your child doesn’t eat three well balanced meals with foods from all the food groups each day. As long is it all balances out over the course of a week or two, your child likely has a healthy diet. My own daughter is a typical example of this (and if I am being honest-it is also the way I prefer to eat). Some days I feel like vegetables and will eat lots, other days I need meat and will have a meat heavy meal. But, when viewed over a whole week, I have eaten a decent percentage from each group. • Do try experimenting with healthy versions of your child’s favorite foods– Try baking chicken nuggets instead of frying, make homemade pizza with low fat cheese and less salt, or oven-baked frozen chips. You might be surprised when your child doesn’t notice the difference. • Do serve a variety of foods. Allow your child to develop a taste for many different flavours. My daughter at age 3 enjoys smoked salmon and cream cheese, broccoli, brussel sprouts and lettuce. She will even eat olives and feta cheese. • Do pay attention to food presentation. You want to make the meal seem like fun. This is especially true for smaller children. Arrange vegetables into the shape of a face on the plate. Make pancakes in animal shapes. Cut everyday sandwiches into different shapes using cookie cutters. • Do let your child help with food preparation in whatever way is possible. Let your child help you cook or sit with you while you cook. A child is much more likely to eat a healthy food that she has helped to prepare. • Do encourage your children to eat slowly– it takes your stomach time to realize that you are full. 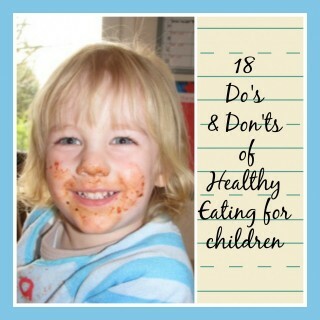 • Do give daily praise for your child’s healthy choices. If you notice them choosing fruit or other healthy foods, tell them and reinforce this by praising them. • Do not “forbid” any foods– that only makes them more desirable. Children are only human. People by nature want what they can’t or shouldn’t have. • Do not use food as a bribe– it makes children resistant to foods that they may be neutral about. Children begin to think that they can use food as a bargaining tool. I’ll only eat my meal if I can have pudding after. • Do use low fat cooking methods that require little or no fat (i.e. grilling, steaming and roasting.) Your own waistline will see the benefits. Remeber though that your body does need some fats so be sensible and don’t cut out fat altogether! • Do add fruit and vegetables to recipes whenever possible– for example, You can add grated vegetables into mince meat. I often grate carrots and courgettes into lasagne or spaghetti mince as they don’t affect the flavour. My children (and husband) don’t know they are there and happily eat the meal. • Do serve main dishes that emphasize healthy complex carbs like brown rice or whole wheat pasta. The earlier you get them used these, the easier it will be. Introducing thme once your child is accustomed to the “white” varieties will be much harder. • Do not encourage your child to drink juice. Serve water as often as possible and avoid all sugary drinks if possible.